So I started looking around for furniture to refinish, and in 10 minutes of sleuthing, I found these two bedside tables on Craigslist – within 6 miles of our house – for FREE! They were sturdy, solid wood, with dovetailed drawers, and besides a few scrapes and some crayon marks in a drawer, they were in great condition, they were just a little dated. After unloading them into our cramped garage, the buyer’s remorse set in. What was I going to do with these dressers? And how long was it going to take me to do it? I didn’t want to re-stain them, because as sturdy as they were, a brown set of drawers made me yawn. But I also didn’t really know what my options were for anything else, (did I mention this was my first official furniture rehab job?). 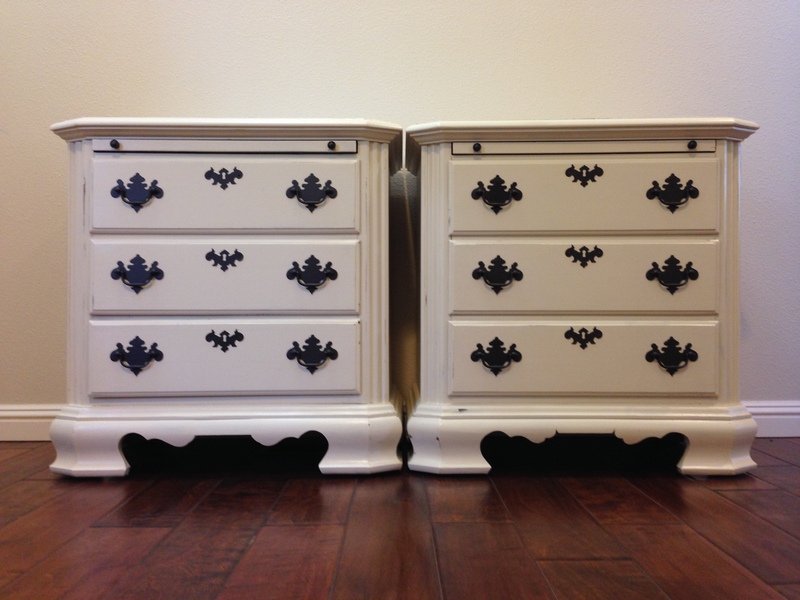 I consulted The Oracle and the most popular method for refinishing furniture was chalk paint. If you are NOT in the know, about this particular product – in a nut shell, if you purchase the Anne Sloane variety, it will run about $40 a quart, but can be distressed (e.g. antiqued) using a wet rag. 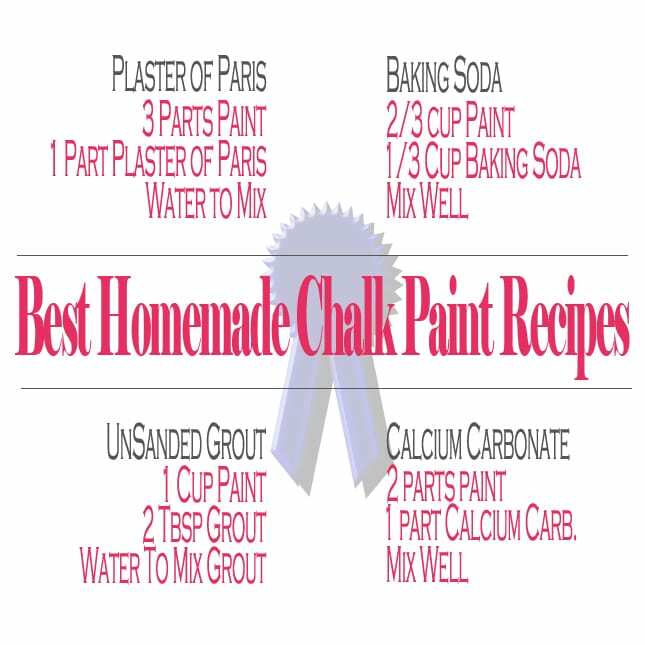 I didn’t want to spend that sort of cash on this project, so after more research, especially from this post from Denise at Salvaged Inspirations, I selected the cost effective approach of making my own chalk paint from powdered Calcium Carbonate. A small aside – chalk paint gives a very flat finish, so it is often finished with wax, which needs to be reapplied every few months, according to this post at Painted Vintage. Degloss the stained surfaces, this allows the paint to stick to the wood. Sand to smooth the painted surface, get rid of unmixed chalk spots, and distress the dressers along edges to mimic actual wear. Note, I did mostly light distressing along some edges, but opted for some deeper sanding in spots to let the wood show through. Check the results and repeat that last two steps two more times. Get tired of the process and decide to be done. Apply three coats of polycrylic (which provided a nice satin finish). Here are pictures of the finished project. I’ve posted them for sale – and it’s been 5 days with no contacts, so I think I’ve overpriced them. I’ve decided to give it a solid week, and will lower the price if no-one is interested. A big thanks to my sweet husband – these dressers took up floor space in front of his collapsible weight station in the garage. Based on his comments that we were packed to the rafters, I cleaned the garage before I started this project. After a week of straightening, reorganizing, and tossing things, there still wasn’t a better place for these to go except in front of his weight bench. When I showed him, he laughed and said not to worry. He realized he was just about to complain about having to pick up something heavy before lowering his weight bench to do some real lifting! We both had a good chuckle at that.